Foundation Repair in North Little Rock - Providing Foundation Repair and Services | American Structure Inc.
A weakened structure will negatively impact the value of a home and cause unnecessary worry. The best way to address this kind of issue is to understand what brought on the foundation or slab problem in the first place, and then tailor a foundation repair solution for the situation at hand. American Structure Inc. has been in business since 2008 with more than 75 years of Combined experience handling soil improvement, deep foundation repair and all types of structural repair. One thing foundation problems all have in common is that they will only get worse when ignored, leaving you exposed to potential property damage. Our team of highly trained experts can repair your foundation and stabilize your home, once again making it structurally sound. Get the professional foundation services you need at prices that you can afford. Our experts always look for ways to protect your home and save you money! Is your home older than 30? ASI accepts and embraces the challenges presented by older homes. Like all home improvements and repairs, some methods work better than others. On the other hand, some methods seem to hardly work at all. In fact, at American Structure Inc., we find that many of our foundation repair jobs are actually just fixing the unsuccessful foundation repairs of other contractors. A complete foundation replacement in Southern Arkansas. The house is placed on temporary supports while the foundation is excavated and replaced. While it seems like the correct fix, the actual problem here could be the soil the home is sitting on. Many homeowners remove and replace their foundation without addressing the problem that caused the foundation issue in the first place. When this happens, they often find that after several years, they’re facing the same foundation problem all over again. At American Structure Inc., we address the problem with warrantied solutions and repairs that will fix your problem once and for all. Concrete underpinning failed to stabilize this house. Eventually, the homeowner had to invest in a different, more permanent solution for their home’s foundation. 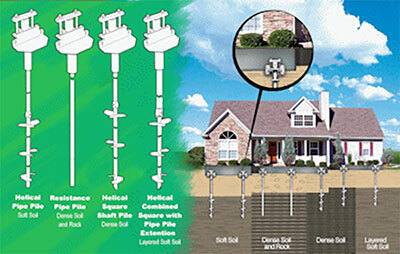 When it comes to foundation footings, “bigger” is not necessarily “better.” Most of the time, the underpinning will not extend beyond the problem soils under your home. If this is true, the larger footings you just paid for will continue to move and cause damage to your foundation. When concrete underpinning is installed and fails to solve the problem, it is much more expensive to repair. Before installing a new foundation system, all that added concrete will need to be removed first. Concrete piers are too big and blunt to be driven deep into foundation soils, so they usually don’t extend to competent supporting soils. Short, 6″-8″ wide concrete cylinders are then pushed into the soil on top of one another, strung together by a wire. Shims are then placed between the top of the concrete pier and the footing, then the soil is backfilled. The over-lifting process required to perform shimming may lead to further damage to your foundation and require more intensive foundation repair.